I have a unique vantage point when it comes to the issue universal cholesterol screening in children, when compared to most pediatricians. My unique view stems from the fact that I am also an internist who deals with those children after they grow up on KFC Double Downs. The AAP's recommendations are supposed to be forward-thinking, addressing the increased rates of obesity in our country (in case you hadn't heard) and responding in kind. Among the 5,798 children who would not have been screened, nearly 10% had elevated LDL cholesterol levels (above 130 mg/dL), according to the study, published in the August issue of Pediatrics. And 1.7% had levels high enough (above 160 mg/dL) to warrant cholesterol-lowering medications. Indeed, of all the children in the study whose LDL levels were above 160, one-third were in the group who would not have been screened. The current guidelines were put in place in the 1990s, and at the time, experts predicted that high cholesterol would be missed in as many as 25% of children, says Neal. But doctors assumed that in most cases, these children would have only slightly elevated cholesterol levels that would eventually be detected when they became adults and would be lowered with diet and exercise. Neal's data show that may not be the case. Further, Neal says, the findings apply not only to heart-disease risk but also to the risk of diabetes, since high cholesterol at a young age is a strong predictor of prediabetes and diabetes. "We worry about that because if these children don't change their ways, then they are going to have Type 2 diabetes," he says. "It's something we would become more aware of if more children were screened." So it seems obvious that we should be screening these children, right? I am fairly certain that many of my pediatric colleagues will become more aggressive on cholesterol screening because of this article. I think this is a mistake. In my post, 10 Rules For Good Medicine, I stated in rule #1: ?Order as few tests as possible. No test should be ordered for informational purposes only; the question, “What will I do with these results?” should always be answerable. If it is not, the test should not be done. The validity of this comment was debated by Dr. Centor on Kevin, MD, and I stand by that statement. We don't order tests to heap on guilt. We don't order tests to "just know" things. The reason to order a test is to make a decision: should I treat this patient, or should further testing be done? We don't have a clear understanding of what high cholesterol numbers mean in children. We don't know if treating cholesterol in children reduces heart disease risk. We don't know the long-term harm in children and teens of using cholesterol-lowering medications. Isn't it clear that high cholesterol causes heart disease? Isn't it clear that lowering cholesterol prevents heart disease? High cholesterol is associated with a higher risk of heart disease. Lowering cholesterol in certain specific situations with certain specific medications is associated with a lower rate of heart disease. We need to be very careful in this. Why? Because much of the claims of alternative medicine are based on the inference that association implies causality. It may be that cholesterol itself (LDL and HDL in particular) is one of the agents that causes heart disease, but that hasn't been proven. Why did Vytorin, which lowers cholesterol more than Zocor, not also lower the rate of heart attacks or fatal cardiac events? (Vytorin contains Zocor plus one other medicine that lowers cholesterol more.) The fact that it doesn't, suggests that cholesterol doesn't tell the whole story. The bottom line? I am not testing kids for cholesterol because I don't want information I can't use. Sure, I can use it to scare parents and kids, but I don't think scare tactics really work. It doesn't change smokers' behavior to tell them how deadly cigarettes are. Besides, since there is no proof that giving a kid Lipitor will help him more than it harms him (you don't give it to girls because of birth defect risk). So you end up giving the same "eat right and exercise" talk you give if you hadn't checked cholesterol in the first place. I'm sure the drug companies wouldn't mind if kids were tested, though. "Do you have any more questions?" I asked, wrapping up a routine visit. She had been my patient for a long time, so communication was easy. "Sure. What do you think of those foot baths people are using?" she asked with a little bit of embarrassment in her expression. "The ones that change color as the draw out toxins?" I said, waving my fingers downward in a wiggly pattern to emphasize the drawing-out process. I have seen people describe this process, and they always do their fingers that way when they describe toxins coming out of the feet. She nodded, and I grinned at her as I gave my response. "I am very certain that they will cause considerable weight loss in a specific area:" I paused for effect, "your wallet." She laughed, and we discussed the mysterious notion that somehow toxins would accumulate in the feet. Her question wasn't because she was herself considering the treatment, but because many around her were swearing by it. My glib answer reflected the fact that I knew her purpose in asking. I didn't have much time to explain my feelings about these treatments, but I did assure her that I don't really care if people spend their money as long as they don't hurt themself. If sticking your feet in water that changes colors makes you feel better, more power to you. The placebo effect is a well-documented phenomenon. 74.6% had used some form of complementary and alternative medicine (CAM). 62.1% had done so within the preceding twelve months. When prayer specifically for health reasons is excluded, these figures fall to 49.8% and 36.0%, respectively. 45.2% had in the last twelve months used prayer for health reasons, either through praying for their own health or through others praying for them. These statistics obviously hinge on what is considered to be "alternative." Because I pray for the health of my elderly parents, does that mean that I have engaged in alternative medicine? Do people taking melatonin or glucosamine chondroitin qualify as well? Still, nobody argues that the use of CAM ("Complementary and alternative medicine") is widespread. Websites and blogs such as Science-Based Medicine and Orac's well-known blog, Respectful Insolence, have challenged many of the outrageous claims made by proponents of alternative medicine. I will leave that job to them. That is not the purpose of this post. My question, and the question I discussed with my colleague, is this: why do people spend so much money on alternative medical therapies? Are we practitioners of "conventional medicine" doing something wrong? Is it bad PR on our part, or is it the smooth talking of the purveyors of alternative therapies that have made so many choose them instead of us? Is it simply the stupidity or gullibility of people that gives an opening to alternative providers, or is there something lacking in conventional treatments? Seriously, why would someone ever do a colonic if they weren't forced to at gunpoint? People want their problems to magically go away. Conventional medicine is not magical. Life is full of pain. We all face circumstances that are frustrating, confusing, and difficult. If we are given the choice between explanations as to why things are hard or promises to fix things quickly, we tend to choose the latter. It is human nature to seek out the easiest solutions to our problems. This is not a bad thing, nor is it a sign of ignorance, it is simply a consequence of our desire to not feel pain (be that physical or emotional). Magical solutions offer an easy way out. There is another reason why people are drawn to magic: the appeal of the mysterious. The child looks at his father in wonder when he produces a coin from behind her ear. She wants her father to be magical and powerful. The mystery doesn't decrease her admiration, it increases it. As she gets older and finds out that he is not magical, she still may admire him; but she won't hold him in the awe she did as a young and naive child. Which is the better state to be in? It's hard to say. I don't like being ignorant, but I do miss the wonder I had as a child. When one of my kids comes to me with a pain in their leg or a stomach ache, they are not coming for an explanation, a plan, or a differential diagnosis; they want me to fix their problem. Unfortunately, medicine often does not work that way. If someone gets an upper respiratory infection, the cure for it is to wait until it goes away. If a person has diabetes, the main approach is not to cure the problem, but accept its presence and minimize the damage. There are often people who come in with problems I can't solve. I go through my usual approach: rule out serious problems first, then work to minimize pain; but am often left without a solution. A customer came to use our Aqua Chi Machine. She had recently retired because of severe arthritis in her hands. After one treatment She was able to open and close both hands. She commented her pain was 80% better. After five treatments, she had no more pain and 100% mobility back. She then asked her husband to try the Aqua-Chi treatments. He had Asthma and used oxygen at night and inhalers during the day. After two treatments he stopped using the oxygen and night and after five treatments was able to quit using the inhalers. He saw a remarkable change in his ability to breathe. "I have experienced kidney failure and poor kidney function throughout my life. I obtained an Aqua-Chi machine and had amazing results! Since using the Aqua-Chi Machine I have not had kidney failure." "I was suffering from Candida overgrowth which was localized in my bladder and uterus. This was the cause of my low energy. After receiving a 35-minute Aqua-Chi foot bath, I felt much stronger. The therapist and I were shocked to find that the Candida seemed to have cleared out of my bladder and uterus. She stated that she had never seen anyone's energy field shift so dramatically in such a short period of time! Since using the Aqua-Chi Machine on a regular basis, I have noticed that I have more energy and stamina and that I sleep more soundly." This is what happens to blood cells in your feet! Apparently, they do line dancing when they are sick! You could find similar claims/testimonials on websites pushing MonaVie, colonics, and chelation therapy. Alternative treatments promise magical results, curing problems for which conventional medicine doesn't have answers. You don't find nearly as many alternative treatments for ear infections, ankle sprains, or appendicitis - things that conventional medicine handles quickly and effectively, in most cases. Alternative treatments usually go after chronic symptoms such as fatigue, and chronic diseases such as arthritis. They fix problems that I often tell patients they have to live with. This is, by the way, why scientifically repudiating alternative therapies does little good. They don't require science since they are magical. There will always be a market for magical treatments. The desire for magic comes from a normal human desire - to be rid of pain as quickly as possible. It's fine to be critical of the hucksters that rob people of their money in exchange for fake magic; but portraying the people who seek alternative therapies as naive and silly is not productive. Conventional medicine cannot and should not compete. We don't offer magic, we offer applied science. The majority of healthcare dollars are spent on technological "miracles," not the hum-drum treatment and management of disease. When we in medicine go for the glamor, we sell our soul to the highest bidder and walk away from where we can do the most good. Medicine is what it is. We don't offer miracles, and that is OK. We don't give guarantees and don't pretend there are always simple answers to problems. Since we take on a losing battle - every one of our patients eventually dies, and all of them will suffer - we will eventually feel and look powerless. We will be powerless. That's OK, because medicine doesn't try to deal with the metaphysical, mysterious, or unscientific. We are focused on reality, and reality is often hard. I am going to get one of those Aqua-Chi foot baths. I have toxins in my spleen that are causing me to ache behind my left elbow. I am sure it will fix that. 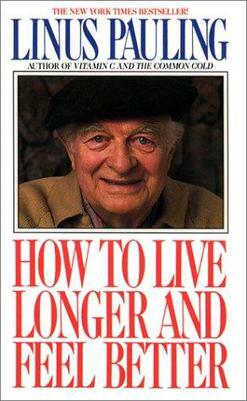 Linus Pauling won the Nobel Prize twice, once for his work in the field of chemistry and once for his activism against above-ground nuclear testing. What I remember him for, however, was his strong advocacy of mega-doses of vitamin C. This is a shame, because this advocacy of what was termed orthomolecular medicine somewhat sullied his otherwise wonderful reputation. The real shame, however, is that he was on the right track with the wrong molecule. He even got the letter "c" right. No, the wonder molecule for health and long life is not ascorbic acid, it is that wondrous molecule known as caffeine. Observation: Children are boisterous and energetic; some are more so than others. Observation: As I have gotten older, my energy level has dropped significantly. Nobody could use the word "boisterous" in a description of me except when preceded with "he sure isn't." Observation: When I have a cup of coffee from Starbucks (Venti), I regain my youthful energy. Conclusion: Children have high levels of endogenous caffeine that gives them energy. Conclusion: As I got older, my caffeine levels dropped. Application: Supplementation of coffee (not decaffeinated) is a natural thing that restores things to the way God meant them to be. Most a.m. coffee drinkers don't realize it, but their morning cups of coffee set their bodies up for a rollercoaster day of highs and lows, only to bottom out at the point of exhaustion. Just a few hours after consumption, when the artificial high dies down, many people may reach for more coffee or something sugary to get another lift, leading to daily fluctuations in energy and alertness, and possibly to eventual chronic adrenal exhaustion. Chronic adrenal exhaustion? My adrenal gland feels energized by my double-shot espresso. Caffeine contains one of these protoplasmic poisons called theobromine which is found in cocoa beans of coffee and chocolate. Caffeine is the most commonly used stimulant with over eighty percent of the population consuming it. It comes in the form of coffee, chocolate, tea and these all contain substances called methyxanthines. Caffeine gives us myriad of physical ailments. Caffeine is known to cause birth defects in babies and should be avoided in pregnancy. It also causes enlargement of breast tissues which leads to benign lumps and can even be connected to breast cancer. Avoiding caffeine will help prevent bone disorders as it is shown to cause a loss of calcium in the bones. There are many obvious signs that caffeine is an addictive drug such as headaches, fatigue, tension and depression lasting for many days after with drawing from it. Finally, this drug also promotes the following examples: elevated heart rate, irregular heartbeat, increased blood pressure, frequent urination, increased gastric acid secretion (which contributes to indigestion, gastritis, and ulcers), nervousness, irritability, insomnia, loss of appetite, nausea, and diarrhea. Ew! Protoplasmic poisons? Are they poisons made up of protoplasm or are they things that poison our protoplasm? The truth is that caffeine is a molecule that is in the class of molecule called methylxanthenes. Theobromine is another methylxanthene that happens to abide in the other nutritional c-containing substance known as chocolate. Statement: Caffeine causes birth defects in humans. Facts: Numerous studies on animals have shown that caffeine can cause birth defects, preterm delivery, reduced fertility, and increase the risk of low-birth weight offspring and other reproductive problems. There have not been any conclusive studies done on humans though. It is still better to play it safe when it comes to inconclusive studies. Facts: Some studies have shown a link between high levels of caffeine consumption and delayed conception. Facts: A few studies have shown that there may be an increase in miscarriages among women who consume more than 300 mg (three 5 oz. cups of coffee) a day. Other outcomes include preterm labor and low-birth weight babies. Again, it is safer to avoid caffeine as much as possible. Statement: A pregnant woman should not consume ANY caffeine. Facts: Experts have stated that moderate levels of caffeine have not been found to have a negative effect on pregnancy. The definition of moderate varies anywhere from 150 mg - 300 mg a day. I would add that this clearly shows that you should not let any of your pets drink coffee if they are pregnant. You don't want mutants running around the house. But Does it make Julienne Fries? Want a drug that could lower your risk of diabetes, Parkinson's disease, and colon cancer? That could lift your mood and treat headaches? That could lower your risk of cavities? If it sounds too good to be true, think again. Coffee, the much maligned but undoubtedly beloved beverage, just made headlines for possibly cutting the risk of the latest disease epidemic, type 2 diabetes. And the real news seems to be that the more you drink, the better. Hah! Not only is my protoplasm safe, it seems the ectoplasm, and even endoplasmic reticulum is safe! The diabetes study actually showed that drinking six or more cups a day decreased a man's risk of diabetes by 54%. I suspect these guys are burning off all of their abdominal fat by being shaky all the time (although the Parkinson's risk bit makes me think twice). Dang, six cups would be as good as having a total gym. Coffee drinking was not linked to either the lowering or the raising of stroke risk among women who developed high blood pressure, diabetes or high cholesterol. But after considering factors such as cigarette and alcohol consumption, van Dam and his colleagues found that healthy women who consumed two to three cups of caffeinated coffee a day had, on average, a 19 percent lower risk for any kind of stroke than did women who drank less than one cup a month. Drinking four or more cups a day lowered risk by 20 percent. Women who drank five to seven cups of coffee a week were 12 percent less likely to have a stroke than were those who downed just one cup a month, the study found. The team then zeroed in on the impact tobacco might have on the coffee-stroke link, noting that coffee drinkers are often also smokers. What they found was striking: Among women who never smoked or had smoked but quit, drinking four or more cups of coffee a day conferred a 43 percent reduced risk for all types of stroke. However, among women with similar coffee habits who also smoked, stroke risk fell by just 3 percent. That's right ladies, the ground goodness can reduce your stroke risk if you want it to. You just have to be committed to the cause, drinking at least four cups per day. So, my java-loving friends, let us raise our mugs for a toast to this beloved bean. It is truly nectar of the gods. And believe me, these gods don't have strokes or diabetes! PS: 10 points to those who figure out the reason I named the first section as I did. The term narcotic is believed to have been coined by the Greek physician Galen to refer to agents that benumb or deaden, causing loss of feeling or paralysis. It is based on the Greek word narcosis, the term used by Hippocrates for the process of benumbing or the benumbed state. Galen listed mandrake root, altercus (eclata) seeds, and poppy juice (opium) as the chief examples. In U.S. legal context, narcotic refers to opium, opium derivatives, and their semi-synthetic or fully synthetic substitutes "as well as cocaine and coca leaves," which although classified as "narcotics" in the U.S. Controlled Substances Act (CSA), are chemically not narcotics. Contrary to popular belief, marijuana is not a narcotic, nor are LSD and other psychedelic drugs. Opioids - Potent pain medications, drugs in this class include Morphine, Dilaudid, Fentanyl (Duragesic), Oxycodone (Percocet, Oxycontin), Meperidine (Demerol), Hydrocodone (Lortab, Vicodin), Codeine, and Propoxyphene (Darvocet). Benzodiazapenes - "Tranquilizer" medications, generally used to treat anxiety. Common drugs in this group include Diazepam (Valium), Lorazepam (Ativan), Clonazepam (Klonapin), Alprazolam (Xanax). Amphetamines - These are stimulant drugs, generally used for attention deficit disorder, although they have been used to help weight loss in the past. Drugs in this class include Methylphenidate (Ritalin, Concerta, Focalin), Dexamphetamine (Dexadrin), and Amphetamine Salts (Adderal, Vyvanse). This list is not meant to be exhaustive; I just put what I encounter most commonly. Schedule 1 - These drugs are illegal to prescribe (except with DEA permission) because, in large part, of their high addiction potential and low medicinal benefit. Drugs such as Heroin, LSD, and (to some people's consternation) Marijuana. Schedule 2 - These drugs can be prescribed by professionals approved by the FDA to do so. They carry significant abuse potential, and so have significant restrictions on how they can be prescribed. For instance, they cannot be called in or sent electronically and cannot have refills. Recently they have required the use of special (expensive) paper with these prescriptions, and many states require the use of a "triplicate" form for prescriptions. The main Schedule 2 drugs I prescribe are ADD meds (Ritalin, Aderall, etc. ), and pain medications (Duragesic, Oxycodone). Schedule 3 - These drugs are "weaker" and overall have a somewhat lower abuse potential (although I am not sure how they made that decision). We can call in and fax these drugs (but for some reason e-prescribing isn't allowed), and they can be given with refills up to 6 months. Drugs on this list include anabolic steroids (testosterone preparations), as well as pain medications (Lortab). Schedule 4 - Supposedly lower abuse potential than schedule 3, but the medications of this class are some of the more commonly abused prescription drugs (such as Xanax, Valium, Ativan). Sleep medications (Ambien) and weaker pain medications (Darvocet) are also in this class. The rules for prescription are the same as schedule 3 (generally). Schedule 5 - Lowest abuse potential - includes cough medications with codeine, and (for some reason), Lyrica - the seizure medication used for fibromyalgia. The significance of this drug schedule lies in the legal repercussions if they are distributed in an illegal manner. Prescribing them in a way that does not adhere to the Controlled Substances Act or giving them in an irresponsible manner can result in significant negative repercussions. If a patient begs me for an antibiotic when not indicated (they do sometimes) or for Viagra (ditto) and I give in to their begging, I am simply practicing bad medicine. However, if a patient begs me for a narcotic when they don't actually need it and I give in, I am committing a crime. Physicians with "suspicious prescribing behaviors" can come under review by the DEA. If guilty, they may get their DEA license revoked or even possibly be prosecuted for a felony. This is why patients with legitimate need for these medications end up feeling like they are "getting the third degree" from their doctor's office when requesting them. No physician wants to come near "suspicious prescribing behaviors" and risk an investigation by the DEA. Even being investigated and acquitted can end up on your record. Narcotic medications are often the best drug for the job. Morphine and its derivatives are some of the most effective pain medications, and so people with painful conditions may be best treated with these medications. Similarly, Valium and other benzodiazepines are very good at helping with anxiety. A person having a panic attack is often best treated with something like Xanax. These medications work - and therein lies the problem. Repeated use of these medications can result in two serious problems: chemical dependency and addiction. Withdrawal - the presence of physical symptoms and clinical signs with the abrupt cessation of the substance. Tolerance (also called Tachyphylaxis) - decreasing effectiveness of the drug over time, requiring higher doses for the same benefit. Most of the scheduled drugs can create chemical dependency (the biggest exception being amphetamines), but other substances can also do this. Alcohol and caffeine are two of the best examples of things that are not (generally) prescription drugs but can create chemical dependence. I personally get a bad headache if I don't have my coffee in the morning. Addiction is different (although the term is sometimes used in place of chemical dependency); it is the development of compulsive behaviors associated with the substance or action. I think of addiction as being mainly a psychological phenomenon, as a person can become addicted to things they aren't chemically dependent on (such as gambling, shopping, and checking the traffic meter for your blog - heh). A person can become addicted to anything that offers significant intense pleasure. In general, the quicker the onset of the pleasure, the more the addiction. So how does this relate to narcotics? In a huge way. How long it has gone on. Patients with acute severe pain are unlikely to abuse pain medications, while those with chronic lower-level pain are at very high risk. So if someone comes in with a fractured arm, pain medication is fairly safe to use. Some physicians are still reluctant to prescribe narcotics even in this situation (being jaded by people who exaggerate or lie to get pain medications), leaving many patients to suffer needlessly. Having broken many bones (as a consequence of distractibility), I can say that pain medications make life much better when your pain is severe. So, for acute severe pain, short-acting medications are appropriate and low-risk. Chronic pain is different. Some people have longstanding pain that is fairly severe - compression fractures in the back, chronic severe degenerative arthritis, and cancer pain can be relentless. It is very difficult for these patients to gauge the severity of the pain, as it becomes hard to remember what being pain-free feels like. It is very hard for the physician to determine the severity as well, as there is no pain-o-meter to stick on someone and measure how much they hurt. You have to take the patient's word for it - which can be hard if the stated pain is inconsistent with physical findings. The result is that some patients suffer silently, while those who report severe pain are held in suspicion by the physician. It is easier to keep pain away than it is to intermittently get rid of it. Patients on long-acting pain medications end up using less medication than those who use only short-acting medications. The nature of short-acting medications is to relieve the pain quickly, but for a short period of time. This creates a repeated decision the patient has to make: "do I hurt enough to take a pain medication?" Since these medications have a euphoric effect along with the pain-relief (longer-acting medications with a slower onset don't have as much of a euphoric effect), the decision becomes even harder. This is what drives many people to addiction - they start taking the medication as much for emotional reasons as for pain relief. It is a very hard situation for the patient with true chronic pain. Long-acting pain medications on a schedule take away this decision and make the risk of addiction much lower while doing a better job on the pain. Long-term use of any narcotic will result in chemical dependency, but that is not nearly as big of a problem as addiction. This approach actually works for anxiety as well - with antidepressant/anti-anxiety medications like Zoloft or Paxil being used to minimize the need for benzodiazepines. There are some people, however, who are simply addicted to the euphoric effect (translation: buzz) they get from these medications. Since we still haven't invented the Pain-O-Meter, they can claim they have significant pain and take advantage of compassionate (or just careless) physicians. Emergency physicians see a disproportionate amount of these "drug-seekers" and so tend to be very jaded toward anyone using narcotics. As a primary care physician, I am constantly measuring the likelihood that a patient is a drug-seeker. It is often very difficult. This makes many people with legitimate pain get labeled as drug-seekers and/or not get adequate treatment for their pain. There are also some physicians who play the role of "candy-man," handing out short-acting narcotics recklessly. This feeds the hunger the drug-seekers have for their substance of choice and make life much harder for the rest of physicians. In every town I have worked in, I have known who these physicians are - and cringe when one of their patients comes through my door. Narcotics are a victim of their own success. They should simply be highly effective drugs for people with significant problems; instead, they are under-used in people with real need and abused by those who shouldn't get them.